Mansfield Park is set for an action-packed day of entertainment this Sunday as the 121st edition of the historic Johnstons of Elgin Hawick Sevens rolls around. Switched to an early May date rather than the usual April slot after the Robbie Dyes reached the BT Cup final, Hawick organisers have been working flat out to put on a show as close to the traditional event supporters have come to love and expect. 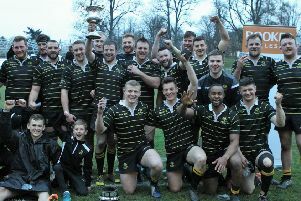 The hosts will be joined by the usual participants for the latest leg of the AM/PM Kings of the Sevens series along with invitational sides 1 Scots (Royal), Hawick YM, Edinburgh University and Biggar in a knock-out style format. “We’re a bit unlucky we have been forced into playing this event on a Sunday, but we’re looking forward to a great day of sevens action,” said tournament convener John Andison this week. “With our appearance in the cup final, it meant the organisation has been disrupted and it’s taken longer than usual to finalise. It means we have 15 sides this time around rather than the typical 16 due to teams unable to commit to a Sunday event. Andison admitted organising Sunday’s event has been challenging with changes hampering his team along the way, but despite all the disruption he remains upbeat. “There has been a number of changes required, but we’re still expecting a great day with a big crowd,” he added. “There will be an AM/PM catering food truck so no-one will go hungry, with the club bar open all day so no one goes thirsty. Andison concluded: “After the tournament, a disco will be running for all those wanting to keep the party going from 6.30pm in the clubhouse, which is free entry with your matchday ticket. Admission prices remain the same as last season at £12 for adults and £6 for concessions. The first round matches kick off at 2pm, with the final at 6.30pm.